The Nixie Transistor Clock kit was designed by Keith Bayern and can be purchased from his website http://www.kabtronics.com. The manual states it should take about 20 hours to complete the kit. My build took 40 hours which in addition to parts loading and soldering, included counting, sorting and preparing parts for the assembly as well as inspection and test after part placement. My first suggestion before starting the kit build is to first read the manual and then read the manual. After you done you may want to read the manual! The Introduction has a warning about the 180-voltage source used by the nixies, which should not be taken lightly. The high voltage section is not built until near the end of the assembly and is assembled in a way that will limit major issues if there is a build problem. The kit packaging is done well, with the various components separated into labeled bags. You should first make sure you have the correct number of components before you start the build. In many cases extra parts are included incase you make a mistake during assembly. For each section built I counted out the number of parts needed and used a muffin pan to hold them. This helped make sure the proper part/value and correct number of parts was used for the section. Many of the parts are connected to a carrier tape. I found a pair of scissors worked nicely to separate parts from the tape. If you have not done much soldering or are a bit rusty, you should make sure to read the soldering section and practice before you start. There are approximately 2900 connections and just one bad or intermittent joint can lead to a lengthy debug session. I would also suggest getting a good temperature controlled soldering iron. 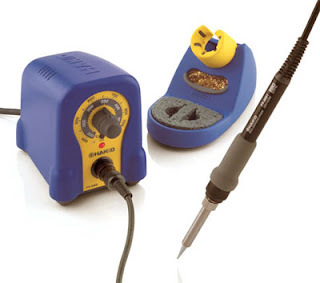 I bought the Hakko FX-888 iron for around $95 USD, which worked very well. Follow the suggested build order, which takes you from the power supply, frequency divider, time counters and decoders to the HV supply. In most cases after section is completed a test is performed to verify the proper operation. Do not continue until you are sure there are no problems. Pay attention to what part/value is being loaded as well as its orientation if it’s a transistor, diode and in some cases capacitor. The resistors do not have a polarity, however I inserted them with the tolerance band (gold) to the left or top to have a consistent look. This helps when you are reviewing the section and makes it look better. After all this is a piece of art! After finishing the power supply section I manage to insert one of the NPN (second row from bottom, second column from left next to large cap) in backwards which gave an unbalanced square wave into the prescaler. The ration for high to low was about 1 to 10. After fixing the NPN mounting, the input to the prescaler was a ratio where the low as 1.4 and the high as 1.8. I also managed to use the wrong resistor in 10 places when building the prescaler (I got to brush up on my part removing skills!). After doing that I double-checked my work as I went. The worst that happened afterwards was I forgot to insert some capacitors in a counter section, which caused the flip-flops not to flip and flop. Make sure you have all the parts loaded in a section that will have the nixie’s point to point wiring done. You don’t want to cover the solder side with a bunch of wire before you solder in the parts. Page 6 parts list has PCB version 3 listed and it should be version 4. The picture in version 4 of the document is of the version 3 board. The 01 Cap mounting missing from instructions on page 1. Page 25 has section 9 listed as Tens of hours and should be tens of minutes. Page 23 Should have a note stating that the HV transistors and the 22K resistors will be loaded after The HV power supply has been tested and nixie sockets MOUNTED (page 34). Two 470 capacitors were included in the kit but only one was used. The schematic shows two 470’s used (C34 & C36) but the silk screen has one 470 and one .001. The silk screen is correct and the schematic (P65) should be updated. The hours counter did not count properly and it was because of noise on the flip-flops due to ringing. The manual does warn about this so it was the first thing I checked. The manual also indicates that this may only be an issue for the hour’s counter, which is what I found. The second problem was with the diodes that optionally are used to turn off the display for a given set of hours. Regardless of which diode position I loaded for the hour turn off, the display always turned off. I put a 100K pull down from ground to the side of R287 opposite the base of Q125 and it fixed the problem. Apparently the signal diodes that are used in the kit leak a bit and the floating transistor base was triggered. There is a section in the manual describing the various components that make up the kit. Knowing this section will help with the assembly. The theory of operation, circuit description, circuit board views and schematics sections as well the problem solving ides section will be needed if you encounter a problem. The parts are represented by symbols on the silkscreen side of the PCB. This makes it very easy to identify what part goes were, however it makes matching the parts to the schematic difficult since the schematics use numbers such as Q125, R234, C101, etc. The layout is very orderly and you can visualize the individual flip-flops, logics gates, etc. which helps matching the schematic layout to the PCB layout. Here are some videos showing some of the testing. I measured the switching transistor case. The case was 135F with five active nixies and 160F when all six were active. The clock's power consumption is around 16 watts when the display is on and around 10 watts when the display is off. If you build a case for the clock be sure to have adequate ventilation. I plan on making one small modification. Currently you must solder the display disable diodes for the given set of hours that you wish to turn off the display. This could get messy if you decide to change the hours. I found that a standard IC fits perfectly in the diode locations. I removed the socket pins that would align with the 12/24-hour diodes and soldered the sockets on the backside of the board. Now I can plug-in the display disable diodes, which will make future changes much simpler. My clocks collection can be found in my clock blog post.